Urban Metalwork can custom design & fabricate Plaques, Frames & Displays. These are suited towards advertising, marketing or as a show piece for an office, man cave or more. All artwork, materials, sizing and design are custom designed by Urban Metalwork. 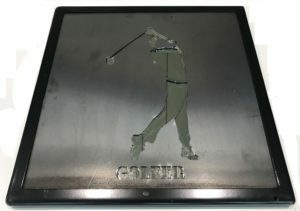 Below we see an example of a Golfer, cut from 3mm Corten Steel, with a Mirror Stainless Steel backing plate and a powdercoated black frame.